The E370 Quad Morphing VCO has begun shipping to dealers worldwide. We have updated and expanded the E370 Product Page with info, videos, and demos. Details are here. The E352 Cloud Terrarium Product Page has also been expanded and more demos/videos added. Details are here. The shipping time for the black panel E352 is now stock to 2 weeks. 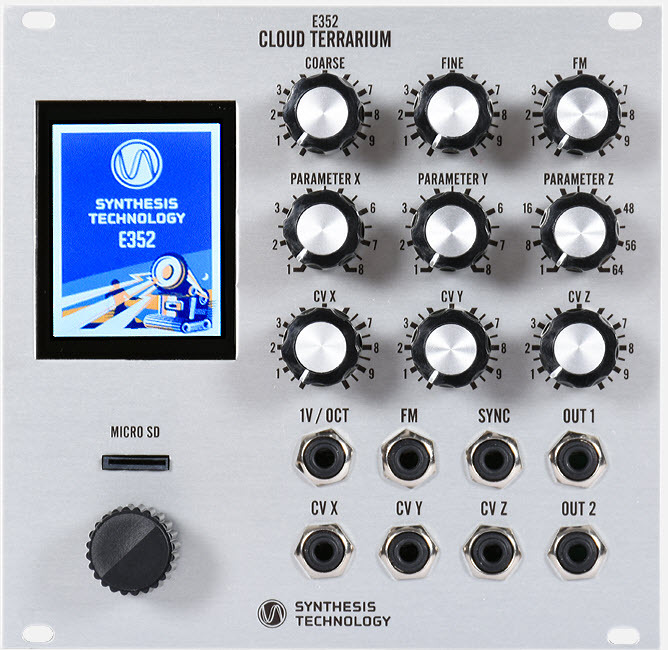 The E352 replaces the E340 Cloud Generator and the E350 Morphing Terrarium which are the first SynthTech Euro modules to enter 'vintage' status. The E352 has shipped over 1000 units around the world, and was named MusicRadar's 2017 Eurorack Module of the Year. Check the E352 page for full details, including a Limited Edition black panel option available on our new online shop. The E370 began as a successful Kickstarter project, and is now shipping to dealers world-wide. Using a new 216MHz DSP and a TFT color display, the E370 is highly programmable. You can even load in your own wavetables using our free cross-platform editor and save/recall presets. See the E370 page for details. Download WaveEdit, our free, open-source wavetable editor! WaveEdit runs on Windows, Mac, and Linux. Using a simple interface and custom graphics, WaveEdit aloows easy editing, creating, and formatting wavetables for use in the E352 and E370 VCO. External wave samples can me imported (from Serum or other .WAV files) and scaled to fit into the E352/E370 format. Visit the WaveEdit page here for details. We've started a series of design videos, highlighting the CAD tools we use use here at Synthtech. You can subscribe to the SynthTech tutorials channel for the full series. There are just a few now, in the months ahead we will add more and place them all on a single web page for quick browsing.